We have been on intimate terms with the 2017 Kia Sportage, going back to a hot-weather test extravaganza in Death Valley, California, during late summer, 2015. At that point, we witnessed, and acted as test assistants, helping Kia engineers perform HVAC development through heat soaking a set of pre-production prototypes. What’s heat soaking, you ask? Think of it as going to a supercharged schvitz. Except that it’s a dry heat. And in this case, with all the camouflaged cladding both inside and out, to disguise the look of the 2017 model, you are essentially standing in the middle of a desert, wearing a parka. It is amazing how oppressive 122-degrees Fahrenheit can actually be. Flash forward nearly seven months and we are now in actual production models of the 2017 Kia Sportage. Was anything lost in translation? Hop in with autoevolution.com to find out. The 2017 Kia Sportage is the fourth generation of the South Korean brand’s five-seat compact Crossover Utility Vehicle. According to Kia, it is the longest running nameplate in the company’s lineup. It was also one of the original vehicles intended for the U.S. market when the brand first appeared on these shores. When we tested the Sportage last year, our cladded versions featured a 1.6-liter turbo GDI four-cylinder, which will not be available for sale in the U.S. For North American consumption, it has been replaced with a base 2.4-liter naturally aspirated Gas Direct Injection (GDI) engine that produces 181 horsepower at 6,000 rpm and 175 lb-ft of torque at 4,000 rpm. Similar to the base offering in the Kia Optima and Hyundai Sonata, it is a good, reliable engine that is fairly bulletproof, if not downright conservative. While the 2.4-liter is the base engine, vehicles presented to us for our Sportage first drive featured the 240-horsepower, 260 lb-ft of torque – 2.0-liter Turbocharged GDI four-cylinder. Both engines are available exclusively with a six- speed automatic transmission, complete with steering wheel-mounted paddleshift levers. Estimated fuel economy ratings for the 2.0-liter turbo have improved by +1 mpg to 20 city / 23 highway/ 21 combined for the AWD system, while the FWD kit tries to achieve 23 city / 29 highway and 25 combined. Both engine choices are available with Front- or Dynamax Intelligent All-Wheel-Drive, manufactured by Kia partner Magna. With this continuous AWD system and its locking center differential, it monitors and then addresses performance needs required to improve lateral stability. Brake inputs and sensors measuring throttle position, yaw rate, and steering position all help to determine when and where the power and grip are needed at any given moment. The suspension is made up of a tried and true MacPherson strut setup in front, stiffened by a new stabilizer bar, while rear duties are taken up by a no-longer-exotic Multilink rear kit. They make contact with the four-point front and rear subframes similar to those found in the Sportage’s big brother Optima. A motor power-assisted rack and pinion steering system, now with 32-bit over the previous 16-bit system, is now faster, has lower friction and moves smoother, thanks to a faster ECU processor. The 2017 Sportage is well connected, too. Three flavors of in-car-entertainment are on tap starting with the LX’s standard 160-watt audio system and its 5.0-inch screen with Bluetooth, streaming audio, SiriusXM Satellite radio and a rearview camera. The mid-level EX features the same audio system but ups the ante with its 7-inch touchscreen and first availability in a Sportage of Kia’s UVO3 eServices, with 14 telematic services, including Apple CarPlay and Android Auto (April availability). Finally, the SX Turbo includes all of the above, with the addition of an 8-inch capacitive touchscreen display and onboard navigation. But wait, there’s more: A 320-watt Harman Kardon premium audio system sits at the top of the Sportage’s Hi-Fi mountain. Built with eight speakers, including a subwoofer, an amplifier and their new, and quite amazing, Clari-Fi music restoration technology, it’s worth the extra coinage. Our tester also featured Kia’s available extra large sun- or moonroof. Take your pick of how to describe it, but it is a terrific window on the world. They include such items as a forward collision warning system (FCWS), autonomous emergency braking (AEB) with pedestrian detection, which has the ability to sniff out a potential shunt, and then bring the Sportage to a halt. And of course there is the Lane Departure Warning System (LDWS), which in our case had an annoying hair-trigger habit of alerting us every time we came within twelve inches of a stripe rather than if we actually were crossing one. Blind Spot Detection (BSD), with its ability to sense traffic up to 230-feet behind you, Lane Change Assist (LCA) and Rear Cross Traffic Alert all help to round out the suite of assists. The Kia Sportage resides in a competitive segment that includes such pugilists as the Honda CR-V, Ford Escape, Toyota RAV4 and others. They are all worthy rivals, and Kia has a lot of ground to make up to even get to the middle of the sales pack. They are hoping that in addition to the obvious restyling and new creature comforts, value added features like the trademarked 10-year /100,000 powertrain warranty will help to make up that difference. Looking at the Sportage from a range of about 50 feet will elicit a feeling of déjà vu all over again. But upon closer examination, it’s evident this is clearly not more of the same. Although an evolutionary progression from the previous version, every body panel is different, from the front clip to the sides, the rooflines and through to the D-pillar, every body panel on the Sportage is new. The well-known Tiger-Nose face of the Sportage features a new high and away headlight assembly that resides further up the flanks and along the sides of the hood. New LED fog lamps are placed on either side of the new wider front grille, designed for improved cooling. A wider look, yes, but reality (and a tape measure) confirms it’s the same width as the previous generation. With new body panels comes a rigidity that is realized through a unibody structure that is 1.6-inches longer than the previous version, with 1.2-inches of that coming between the wheels. The result is an improved ride and more legroom in the second row. This new Kia includes 51-percent more advanced high-strength steel over the previous version, which featured only 18-percent, and an improvement in torsional rigidity to the tune of 39-percent. Along the way, that was good for a 55-pound weight savings, partially due to the use of 113-yards of structural adhesive. Kia engineers were quick to point out that’s more than a U.S. football field. It’s a net gain of five-times more structural adhesive than the last Sportage and helps reduce squeaks and rattles for improved Noise, Vibration and Harshness (NVH) levels. The interior of the 2017 Kia Sportage has improved as well, featuring soft touch materials throughout and a more driver-centric display, which is canted 7.2-degrees towards the commander of this ship. While the LX is fabric- swathed, the EX and SX Turbo have gone bovine, featuring leather front and back. Through the aforementioned growth of the Sportage platform, interior space has grown as well, with increased head- and legroom, and a lower interior floor (Ground clearance is unchanged). Designers have relocated the license plate from the bumper to the tailgate for a new lower lift-over height. 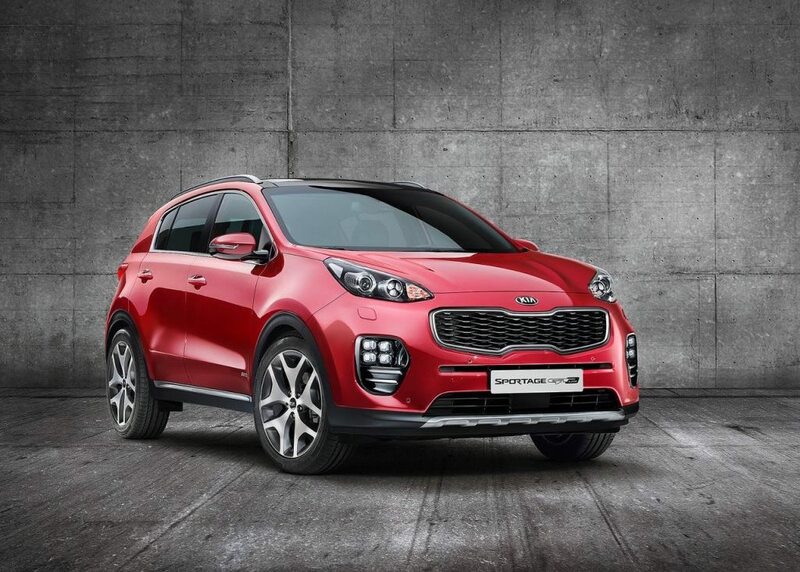 On city streets and interstate highways which, truth be told, is where the Sportage will be found 99-percent of the time, our 2.0-liter turbo made for quite the steady cruiser, on all types of surfaces and speeds. Sure, the six-speed automatic would let you know it was exerting itself when called on to perform some heavy lifting such as passing on narrow country backroads or on an expressway on ramp, but once it found its sweet spot, the yelping calmed down to a normal roar, er, purr. Flipping through the paddle shift levers offered a fun diversion from behind the wheel, even if it was just during a trip to the local Target or Home Depot. Imagine channeling your inner Nico Rosberg with a huge load of mulch or home improvement items in the back. Off-roading was more spectacular, with ruts that could potentially swallow lesser vehicles. This is where we really became impressed with the new structure of the Sportage. Spirited piloting through the Jumping Cholla-infested Galetta Meadows displayed the newfound rigidity of this Kia that uttered not one groan or creak as we piloted through the desert statues by artist Richard Breceda. Despite our aggressive pace, the Dynamax all-wheel-drive system managed to keep the traction flowing in a forward progression while running over large rocks that seemingly popped up randomly and without warning on our trail. Sure the Kia Sportage may not be as powerful or as cargo accommodating as a RAV4 or a Ford Escape or any of the other competitors in the field. Still, it is quite engaging behind the wheel, and offers quality and value that are absolutely worth a look.